Raita is so simple why would someone need a recipe for it, be it cucumber raita or okra (bhindi) raita. We anyways customize our raita recipe depending on how simple or heavy or spicy the other dishes on the table are, the recipe is not so rigid and keeps changing according to the seasons too. The intrinsic beauty of Indian cuisines, especially home cooking, is that we use each produce in just the right way to suit ourselves. Bhindi ka raita is often made with a little mature okra (bhindi) that has not turned fibrous but has lost the tenderness. The mature fibrous okra is also used in some curries I will share sometime, right now it is about bhindi ka raita. 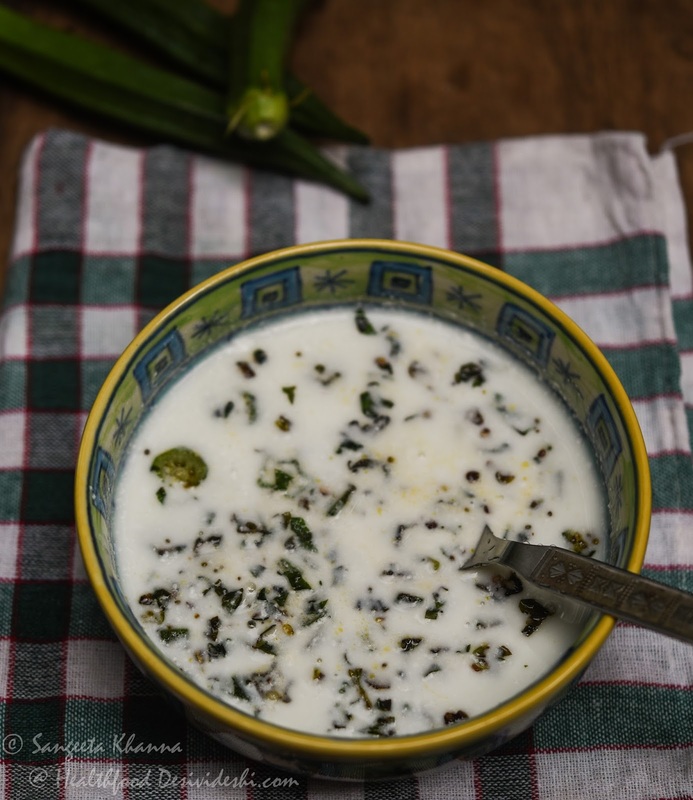 I had shared this bhindi ka raita on instagram and many had asked the recipe. I hope you like it when you make. In the traditional recipe the bhindi slices are deep fried to make the raita but I never do that. Slow cooking in very little oil in a shallow wide pan works wonderfully to crisp up the bhindi slices to make a great textured bhindi raita. Rinse the okra and pat them dry. Remove the crowns and hold them together over the chopping board. Slice them all together in very thin roundels. Heat the mustard oil in a flat base and tip in the asafoetida and cumin seeds and let them splutter and get aromatic. Now add the chopped chilies, curry leaves and the sliced okra, mix well and lower the heat. Spread out the okra slices over the surface of flat base pan and let them brown slowly and dehydrate a bit. Stir after every 3-4 minutes and let it cook for about 10 minutes on very low heat so the okra becomes almost crisp. Add the salt, pepper and roasted cumin powder and take off the heat. You can bake the okra in the oven after mixing all the ingredients too. Now pour everything over the whisked yogurt, adjust seasoning and serve chilled or at room temperature. 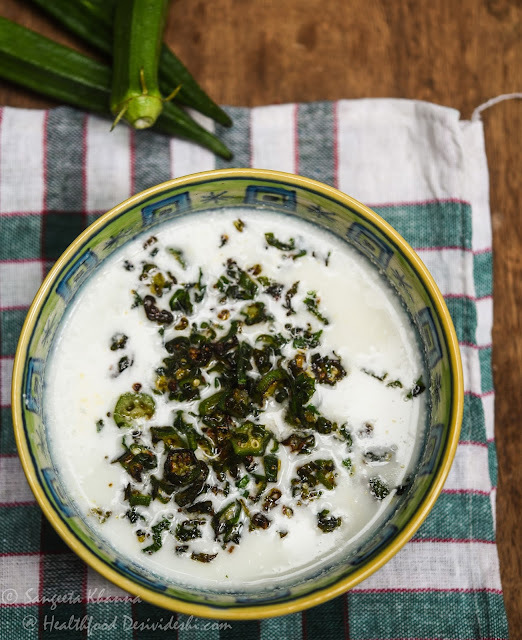 We serve this bhindi ka raita mostly with dal chawal meals but any roti or paratha subzi meal also feels great with this raita. The heat level of the raita is always adjusted according to the type of subzi and dal made for the meal. I made this today and had it with sambar rice. It was heavenly. Thanks Sangeeta for this delectable recipe.